Person or group of people visit/find an interesting location. They think said location is pretty cool. They tell other people about said location, and more people begin to visit the location. Word continues to spread until a large mass of people frequent the location on a consistent basis. Said location is now deemed a tourist location, which, according to some people, spoils the novelty of visiting the location. I’m sure there are variances to this formula, but the point is that awesome places attract more people. Tourist locations wouldn’t become “touristy” if they weren’t amazing to begin with. That’s how they become touristy. Not every cool place across the globe is going to be vacant. In fact, that’s usually not the case. I’ve seen some, but it’s rare. My question then, is, what’s wrong with touristy locations? Of course, they lose some of the novelty if they are flooded with tourists, salespeople or whatever else that detracts from the experience. I get that. However, that does not mean it is simply something no one should ever visit. There are still great touristy locations across the world. I have been to some that weren’t so great, but usually, it’s not the people that ruin it. It’s just the location itself. Some places are touristy and just are not that interesting or exciting. Doi Suthep in Thailand is an example of this. It’s very touristy, yet it really isn’t anything special (from a visitor’s point of view). It’s just another one of Thailand’s many temples, distinct only in its hillside location overlooking the city. On the other hand, one of the greatest places I have ever traveled to is quite touristy: Angkor Wat. Thus, I don’t see the importance of making a distinction between the two. I have been to touristy sites that are awesome and non-touristy sites that are not so great. I think it really just depends on what the site is and what a person’s personal preferences are. Too many people can certainly take away from the experience that one has while visiting somewhere, but I don’t think that is any reason to exclude it completely from a trip without thinking about how interesting it could be. Visiting at the proper time of the day can also help with this. When I traveled to Busan in South Korea, I went to one of the most traveled locations in the city on the first bus in the morning. I got there so early that everything was empty. All of the typical shops and stalls that were lined up outside of the temple were closed up. I almost thought I was in the wrong place because of how empty it was. Then I thought I came before the temple even opened (do temples close?). I guess nobody just wanted to get up that early and visit a temple. It was fortunate for me because I got an almost private view of the temple. The waves quietly washing up against the shore really added to my experience, and this was one visit I was really grateful for the lack of people that were there. By the time I left, people were slowly starting to fill up the place. I wouldn’t want to visit at any other time. However, if I had a choice between visiting the temple at all or not visiting, I would definitely choose to go. 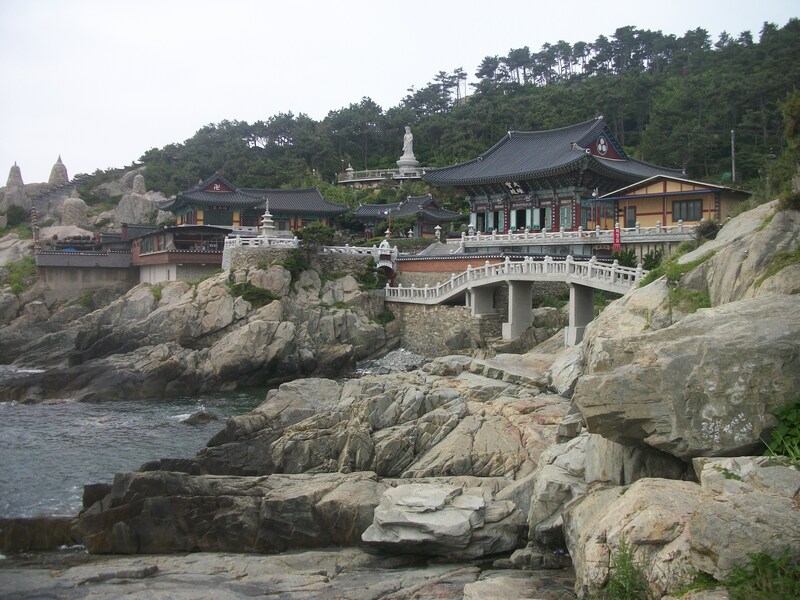 It was that awesome of a place (for those wondering, I’m talking about Yonggungsa Temple in Busan). And that’s really what’s at the heart of the matter. Some places may be touristy, but that’s just because they’re (supposedly) awesome places. That doesn’t necessarily make it bad. That just means it’s going to be more crowded (and more touristy). I think places should be visited based on their merits, not just their “status.” All trip locations have the capacity to be enjoyable, regardless of their classification. It took me awhile, but I finally finished my Fulbright application. Even though I started the application in June, it took me all the way up until the deadline (October 13th) in order for me to complete it. This is a testament to the length of the process and the dedication that applicants need to have in order to complete and submit a quality application. The last two components of the application that I completed were the affiliation letter and the language evaluation. I also had my campus committee meeting a few weeks ago. The affiliation letter was the most frustrating part of the application process. While the majority of the process is dedicated to writing and revising the statement of grant purpose and personal statement, selfishly asking professors in another country for an affiliation letter to research in the country seems inauthenthic and serves as an additional hurdle for applicants to surpass. Many professors don’t even want to take the time to read applicants’ proposals because it just seems like undue work for them. Professors certainly do not get the same amount of accolades for accepting to be a Fulbright adviser as they would, say, being on a students’ thesis committee, so the whole process does not give much incentive for them to accept a Fulbright proposal. When I reached out to professors, the amount of responses I got were sparse, even though I typically cc’ed each professor’s assistant to the e-mails I sent. I don’t blame any of them for the lack of fervor they showed in acquiescing to my request. A random student from a completely different country that they have no relationship with is asking them to read his proposal, write a letter of affiliation and accept to be his advisor for ten months? Sounds dubious to me too. The absolute best way to go about getting an affiliation letter is to find the person on campus who negotiates exchange programs between other schools. I found this out the hard way. After cold e-mailing a dozen professors from different universities and getting no real leads, I was completely stuck. Out of desperation, I started asking different people on campus for advice and was eventually pointed in the correct direction. Getting in contact with the exchange advisor was the only reason I ended up getting the letter in the end, and it just so happened to be only a few days before the deadline, which would have been a lot of work for nothing. My language evaluation was a similar failure. I actually finished it after the campus deadline. However, since the campus deadline is a couple of weeks before the program’s official deadline, I was still able to submit my project. If I had tried to turn it in after the official deadline, then I would have been out of luck. There are no exceptions to the deadline, and anyone who is late cannot be considered for a Fulbright award. However, I could have simply turned it in without a language evaluation. This was my original intention anyway. My Korean is not very good, so I figured I could just list that I have a basic level of Korean without actually submitting a language evaluation. Unfortunately, this is not the case. So long as an applicant knows a language at a level higher than essentially zero, he has to submit a language evaluation: another formality of the Fulbright application process. Since I know a little bit of Korean, at the very least, I wanted to reflect that on my application. Therefore, at the last second, I was forced to find an evaluator to test my language abilities. Of course, an applicant also has the option of just saying he has no understanding of the language of the country he is applying to. I was considering doing this if I could not find a language evaluator in time for the official deadline. However, this is not recommended if an applicant knows the language. Knowing the country’s language, or at the very least, showing the Fulbright committee an effort to learn the language is quite beneficial to an applicant. As far as my campus committee meeting goes, it went quite well. It was much less of an interview as I thought it would be and more of an advising session. I learned a lot of great things from my campus committee, and they really helped me to focus my statement of grant purpose for its final iteration. It helped that I am knowledgeable about my Fulbright topic, so I was able to comfortably discuss with them some of my concerns with the project going forward. In all, the campus committee meeting is one of the more enjoyable and useful aspects of the application process, and I actually wish I could have met with them more than once. So, that’s it as far as my Fulbright application goes. If anybody has any questions about the process or even my project, feel free to ask them in the comments section below. I won’t find out about the status of my application until early next year, but when I find out, I will make sure to post an update about it. Thanks for reading. Until next time. I have applied for so many things in my life that I can’t even remember what they all are. I have applied to schools. I have spent summers applying for countless numbers of jobs. I have applied for scholarships, fellowships and internships. I have applied for study abroad, and I have applied for short trips abroad. Many of my colleagues at grad school go through a similar process. With an interdisciplinary degree, in a very competitive and global world it is especially important for recent graduates to have a wide range of skills that are transferable to many different career paths. Thus, putting out countless numbers of applications to a variety of opportunities is not uncommon. However, what many people do not have experience with is the Fulbright application process. Fulbright is such a prestigious name among college awards that some do not even apply for it for fear of not getting accepting. Applicants must devote a vast amount of time to the process in order to be competitive, which is what shies some people away from even trying to apply in the first place. I am dedicating this post to discussing what the process is like for anybody who is interested in applying or for anyone who is just interested in knowing how the process works. Disclaimer: it’s complex and difficult. For anybody unfamiliar with the program, Fulbright is actually a multitude of different awards housed under one name. The two most familiar awards are the teaching abroad scholarship and the research abroad scholarship; however, there are a number of other awards available, such as awards dedicated to art research, digital media production and a slew of other opportunities that I’m certain exist but I’m not aware of. I am currently in the process of applying for the research grant. Most grants require a couple of basic components. The two primary elements that require the most work from the applicant are the personal statement and the statement of grant purpose. This is especially true if an applicant applies through their home institution. Revising and meeting with campus advisors is one of the most time consuming parts of the whole process but also probably the most crucial. I have met with my Fulbright advisor more than four times since the summer started and have made more than ten total revisions to my application materials. This, obviously, takes a considerable amount of time. Fulbright applicants also have to supply three different letters of recommendation, and depending on the type of grant being applied for, have to submit a letter of affiliation from someone in the country that they are applying for. There are a couple of smaller additional requirements, as well, especially as the applicant moves along in the application process. One of these is an on-campus interview with campus committee members after the main application is submitted online. This interview is just designed for the committee to get a better understanding of the project and its details and to give the project the committee’s final stamp of approval. One of the most difficult parts of the application, however, is that it is just very confusing. During the application process, I found myself doing things incorrectly a number of times just because of how unclear the application process is. For instance, I wasn’t even aware I had to do an online application for my project because I am working through my school’s Fulbright office to complete my application materials. I thought they submitted all of the materials for me. This is incorrect. It doesn’t matter whether applicants apply through the school or by themselves, applications need to be filled out online by the applicants. Of course, the application process also consists of other basic and mundane components similar to other comprehensive applications. Applicants need to upload transcripts and other relevant documents to their applications. They also have to answer a number of questions within the online application detailing their project and reasons for pursuing the project. Even though all of this is covered in the statement of grant purpose and personal statement, it is required. Lastly, if an applicant has any sort of language proficiency in the country for which he is applying, he must get a language evaluator to attest to his proficiency. This evaluator, like the rest of the process, must be found by the applicant, and the proficiency test must also be secured by the applicant. Fulbright does not even provide proficiency test templates. Of course, each language would require a different test. However, by not providing a template for their proficiency requirements, it makes it harder to better evaluate the applicant’s language proficiency. Fulbright only provides a basic chart for how the evaluator is supposed to test the applicant’s proficiency, but its lack of detail creates ambiguity for how the evaluator should effectively judge the applicant’s language abilities based on Fulbright’s expected requirements. This underscores what is really the main problem with the whole Fulbright process. The applicant has to do everything. Fulbright really doesn’t provide any support to the applicants beyond the application instructions. This makes the Fulbright process more of a guessing game than an actual merit-based competition. Many applicants may stumble across the proper resources they need to submit the best application possible, but other applicants may not even understand the proper requirements for it. And with so much convoluted information on the Fulbright website, it makes it a slog for applicants to work through the process. However, there is a benefit to going through the whole Fulbright application process, whether or not an applicant is selected. Understanding how these applications work helps applicants during the process of future applications. Fulbright is definitely one of the hardest applications I have worked through, and I am not even done with the process. I still have my campus committee interview to do, as well as securing a letter of affiliation. Going through such a difficult process will provide valuable experience to applicants looking to apply to other opportunities with rigorous competition. I’ll send out an update about my campus committee interview and the rest of the Fulbright progress as it gets closer to completion. Then we’ll see how I really did. Until next time, thanks for reading. Alessandro Ford is, according to the article, the first westerner to enroll at Kim Il-Sung University, the nation’s premier university that both Kim Il-Sung’s son and grandson have attended. To my knowledge, the only running program that allows Americans to study abroad in North Korea is known as the Pyongyang Project and has only been running since 2009. I don’t have the exact numbers on how many students have studied abroad in North Korea, but I can imagine the overall enrollment rates are low, particularly for westerners. I have not read any previous stories about foreigners studying abroad in North Korea before this one either, which is why I find it particularly interesting. I find this an interesting quote within his whole account of studying abroad in North Korea. What I find weird is that even if North Koreans did believe what they were saying about America, that doesn’t mean that they weren’t brainwashed to think in that way. That is literally the definition of brainwash: to get somebody to completely believe something else through coercion and manipulation. It’s basically forced indoctrination. Apart from this, he’s a westerner studying abroad in North Korea. Just think about what he’s actually going to have access to while he’s in North Korea. Surely, they monitored him constantly. Of course, as the article details, he wasn’t even allowed to use the internet. The only contact he had was by phone call with his mother: something that they also probably watched him do every week. I doubt they even let him leave Pyongyang, and if they did, they would only take him to other reasonably affluent areas that are scripted to only show good aspects of North Korea. I’m not saying his whole account is a lie. It sounds like an awesome experience, and he details some interesting aspects of his trip in that article. However, it is very short-sighted to think that the experiences he had in Pyongyang are analogous to the way people live in other North Korea cities, or even, the countryside. If he thinks the facilities in Pyongyang are spartan, I bet he’d be quite surprised once he left the confines of the privileged city of North Korean elite. He does make a cognizant argument towards the end of that article, though. Asked whether the best policy is to engage or isolate North Korea, he steadfastly argues that the best approach is to judiciously communicate with them, which I agree with. Considering the failed progress through past attempts at isolating them, it makes no sense to continue forward with policies and sanctions that will only aggravate more human rights abuses in North Korea, especially if they economically squeeze the country. The U.S. doesn’t sanction China because of their human rights abuses, so I’m not sure how it makes sense to continue doing it to North Korea. Of course, sanctioning China would hurt U.S. trade, which is something America will never opt to do. Therefore, since sanctions to North Korea aren’t detrimental to the U.S., America sees no reason to collaborate with them. If only there was a greater incentive for open cooperation. I guess human rights abuses don’t count. Either way, check out the full article here. There is a lot of great stuff in it, and interesting comments too. Ford even offers some additional insights in the comments section. Loser Back Home A now defunct blog that I stumbled across. Well worth the entertaining read. Maggie Moo Does Korea Informative and fun: a blog about teaching English with EPIK. Marshallogue Life lessons and clever quips; updated often. Awesome.